"A special attack card with fire-based attacks. Delivers exceptionally powerful strikes." Defeat the Nobodies in Betwixt and Between. "An extremely capable weapon that is replete with the power of fire." "An upgraded Bond of Flame. Extremely capable and replete with the power of fire." 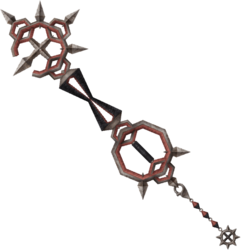 The Bond of Flame is a Keychain that is found in Kingdom Hearts Re:Chain of Memories, Kingdom Hearts II, and Kingdom Hearts 358/2 Days. In Kingdom Hearts 358/2 Days, it can be upgraded to the Bond of Flame+. In Kingdom Hearts II, Sora obtains the Bond of Flame from Axel after he sacrifices himself to defeat the Nobodies at Betwixt and Between. Sora can be equipped with this Keyblade while in Mission Mode in Kingdom Hearts 358/2 Days. The Keychain, teeth, and blade resembles Axel's Eternal Flames chakrams. When it is swung, tiny chakrams and flames appear. The two chakrams that make up the Keyblade are joined by a metal numeral 8 and they also have eight total spikes, a reference to Axel's position within the Organization. The Keyblade's name references the friendship between Roxas and Axel, and later the debt Axel owed to Sora. Bond of Flame, like Dream Sword, has a unique moveset in comparison to all of the identical combos Sora receives when any gear is equipped. The ground combo contains only two moves: a basic, downward slash, followed by a unique move in which Sora turns and swings the Keyblade with all his might in front of him. After the former move, a -Combo can be used, in which Sora jumps in the air and vertically spins, striking upward with his Keyblade at the end. The aerial combo begins with an upward sweep with the Keyblade, followed by a downward slash. It is finished with a spinning move, in which Sora vertically spins, striking upward with the Keyblade at the end. This page was last edited on 3 April 2019, at 20:48.